Pivot Tutors offers high quality private instruction to help students excel in school. We offer ACT and SAT Programs, AP/Honors/Regular Academic Tutoring for Math, Science and Humanities classes. Summer vacation! The most hallowed time of year for students everywhere! But now that you are in high school, you’re probably asking yourself: how do I make the most of my summer vacation and still enjoy it?? Summertime is useful for so many things - but most importantly, it is a time for you to explore options that you may not have during the school year (because life), and time to restore yourself so that you are the most committed and best version of yourself for the upcoming school year! Sleep sleep sleep! 😴😴😴Sleep is underrated, and it is SO important in making sure you do your best work not only in school, but everywhere! Read read read! 📚📚📚Now is the time to read things that interest YOU! Reading for fun is also underrated - it can be anything! Novels, journal articles, magazines, non-fiction, blogs - just READ! Take a class! It could be a class that you don’t want to have to take during the school year (though, please don’t take an important class this way - it’s the best to do an elective that you can get out of the way, not, say, AP Lang), or an enrichment class for something that you are interested in - either way, it will probably be a lot more fun during the summer and not crammed in during the school year! Prep for a test that you can get out of the way before school starts back up! If possible, prepping and taking the ACT or SAT at the beginning of Junior or Senior year (depending on your scores, schedule, availability etc.) is a great way to have a head start on the fall semester! You will be able to prep for an important test, while still having time to have fun and enjoy summer! Find a college counselor! It could be a private college counselor, or your school’s counselor - but whoever you choose will be a VIP in helping you prepare and apply for colleges! They can also help you figure out what to do over the summer if you have specific programs/colleges you already know you’re interested in! Visit college/university campuses! Summer is a great time to check these visits off the list, especially if the schools are far away and would mean missing a lot of school to take a trip. School might not be in session, but you will still be able to get a feel for the campus and take a tour! And did I mention sleep? 1) Sleep more! Unconventional, I know, but sleep really does help you process the information you’ve learned throughout the day, and it also helps your brain rest and recuperate so that you are awake and alert while solving 100 equations, or writing two page-long essays! 2) Drink water! Before, during, and after the test! 3) Put down the screens! While studying, try to limit yourself to one screen at a time (only if necessary to study!). Studying will be more meaningful, and hopefully not take as long, if your attention is not divided between Instagram, Snapchat, and your AP World History notes! 4) Try studying with a friend! Reviewing and talking out notes with a classmate or friend can be helpful, and definitely less lonely! The more you teach another person about the topic, the more knowledgable you become! 5) Create a study plan! Don’t start studying the night before your final - plan out strategically, know when you can devote the most time and attention to studying for each test you have, and write out a plan so you can stick to it! Read more! This may seem obvious, but the number one way to get better at something is to do it more often. For example, if you skip workouts for a week, your first time back on the treadmill always feels horrible, slow, and torturous. Whether it’s starting a new novel every couple of weeks, finding a blog that you enjoy, or catching up on daily news, read something for pleasure every single day. It doesn’t have to be particularly strenuous either - just 30 minutes a day will do. The goal is to become comfortable and confident with the act of reading itself, which with time will naturally improve your reading tempo and comprehension. That way, when you encounter the reading section, it won’t feel like the first time back on the treadmill. Skim for main ideas and scan for key details. Skimming and scanning are not terms for just lazy reading. They are separate skills that require different visual and cognitive functions. Skimming is looking for the overall tone, purpose and idea of the text. Practice looking over a page in a few seconds and answering the question: “what is the author’s main point?” You will learn how to determine which parts are central and which parts of the text you can skip over. Scanning, on the other hand, is when you are searching for a particular piece of information. Practice finding key terms on the page, whether its a name, a date, or a piece of evidence. The better you are at these two essential reading skills, the better you can perform on timed tests. Identify argumentative and rhetorical patterns. Whenever you are reading texts for your classes or browsing the internet, try paying special attention to the way that writers sway their audience one way or another. You will begin to notice how arguments are organized from start to finish, and the various rhetorical tactics that are employed to build an argument such as evidence, counterarguments, and logic - to list a few. Many articles will have a persuasive element, whether its scientific, political, historical, or even conversational. Make a mental note of the rhetorical tactics that are explicit, but also those that are subtle like the tone or context of the argument. Make a vocabulary list. I can hear you groaning from here. Yes, this might seem like a stale study hack from the 80’s, but having a broad vocabulary can be a huge asset on tests. Nothing slows down reading like running into a bizarre word in the middle of an already confusing passage. Plus, a single word can carry a lot of context clues and tonal nuances which can be extremely helpful in determining the point of the passage as a whole. It’s easy to keep a note on your phone to jot down new words and definitions whenever you may encounter them. Write your own comprehension questions. One of the best ways to check if you’ve absorbed what you’ve just read is to ask questions about it. Imagine you are someone who wants to know more about the subject of the text. Write questions that target key components of the article’s content, argument, or tone. You can get very creative and come up with fun, thought provoking questions. This can also double as a review technique for tests or essays you may have coming up! These days, anyone can be a tutor: there is no license or formal training, and anyone—with or without a degree can find work as tutor. But a truly effective tutor is a rarity—a special individual who is not only an expert in the material, but can also connect with a student, patiently convey information, and be a role model and mentor. Moreover, an effective tutor should teach long-term study habits and skills. Your tutor should be able to teach to different learning styles. All people learn differently. Tutors should may take some experimentation to find out your student’s learning preferences: Does your student prefer auditory or visual learning? Do they process text better when they read silently, or when they vocalize their thoughts and reactions? Adjusting to your student’s style can make your tutoring sessions more effective and enjoyable. Establish study habits early on. An exceptional tutor is not only an expert at relating information, but also at cultivating good discipline, attitudes, and habits in their student. Don’t just teach them what they need to learn - teach them how to learn. Tutors strive to guide their students to become more independent and self-motivated learners, and provide them the necessary tools to do so. Build upon previous lessons/ideas. Whether it be math, English, or science, no idea exists in a vacuum. Covering a concept once (no matter how thoroughly) in session doesn’t mean it’s done - plan review exercises, revisit concepts when they appear in future sessions, and continue building upon knowledge. Keep each other accountable. During each lesson, make sure to always set expectations for both your student and for yourself. Ask your student to complete their homework, and also assure them that you will cover all their questions until they are fully comfortable with the material. Communicate frankly and use language of mutual accountability. The concepts might not always be easy or fun, but learning can and should be! New material is often challenging, which may be daunting to an inexperienced learner. However, an engaging tutor knows how to take a challenging concept and break it down into easier steps, all the while making the experience of dissecting a problem seem fun and even empowering. Be specific about successes - and about failures. When praising a student, ‘good job!’ is not as useful as ‘great work catching all the misplaced modifiers in this passage,” for example. It’s nice to feel encouraged, but students improve when they know exactly what they’re doing right. This is especially important when addressing weaknesses, because instead of putting down the student themselves, we simply direct their efforts towards improving something concrete. Turn mistakes into goals. Mistakes are some of the best opportunities for learning. If we frame past mistakes as future goals, the student can target the areas they need the most, and find motivation to tackle their challenges head on. Repetition - but only the good kind. If repetition is misused in tutoring, it can be counterproductive. However, repetition is not always a bad thing! It is incredibly important for a student to repeatedly practice the same skill in order to accomplish a task faster and with more ease. Learning to apply repetition at optimal moments is crucial for your student to refine their performance. Celebrate progress. Don’t forget to acknowledge and commend your student for steps in the right direction. Learning is a process, which takes a great deal of time and effort. We may not see ideal results immediately, but we can always recognize and encourage progress. Connect with your student! Tutoring is an amazing opportunity to create a lasting positive relationship with a student. Show that you are invested in the student and that you truly care about their success, and this can impact them for the rest of their lives! Congratulations! We've officially made it to spring 🎉🌸🌷🌺💐🎉! And perhaps you're already on spring break? Or at least close to spring break.. Remember: you've been preparing for these tests all year in your AP classes! The SAT subject tests can be a bit of a mystery for a lot of students...Do I need to take subject tests? Which ones are the best for me to take? Do all schools require subject tests? How are the tests graded? But recently, we have had a lot of students who are curious about the scoring on the tests and what a 'guessing penalty' is! Subject tests are graded on a scale of 200-800, similar to how the subsections of the SAT are graded. But the Subject Tests continue the guessing penalty, an old SAT tradition that they've since done away with on the general test. The College Board states that "The system takes the circles that you filled in and calculates your raw score. Basically, this is the sum of points you earned based on the number of questions you answered correctly, minus a fraction of the number of the questions that you answered incorrectly[.]" ACT or SAT? How do I decide? Early in the college application process, students are faced with a huge question: do I take the ACT, the SAT, or BOTH??? For starters, ALL colleges and universities accept BOTH the ACT and the SAT, so you do not have to stress about preparing for two separate tests. Just pick one test to focus on and prepare for! Make sure to take both tests and make sure that you are taking real tests! There are companies that offer “hybrid ACT/SAT” tests that give students a blended test, but this makes it harder for students to truly know which test is the best fit because the questions were not real test questions! 2. Once you have your baseline scores, ask for advice! Are your scores similar on both tests? Did you have a personal preference when you took the tests? Or is there one test that you scored significantly higher on (this could be a point or two difference, but a higher score on a diagnostic generally points to a higher growth potential on the test)? 3. Decide which test to take! Many students are overwhelmed at the prospect of deciding between the ACT and SAT. And that’s totally okay! If after taking the diagnostic tests, you are still confused or unsure about which test is the better fit, come in for your first session and you and your tutor can discuss the scores, the pros and cons of both tests, and what they think is the best fit. You definitely don’t have to make the decision alone! Overall, the ACT is the faster test: it requires students to read the information presented and evaluate and answer more questions in less time. But, the questions are more straightforward, and easier to answer than similar questions on the SAT. The SAT does give students more time per question, but the questions themselves are longer and the language is less direct. The #1 way to determine which test is right for you is to take a diagnostic ACT and SAT, and compare your scores, as well as your experiences of both tests. 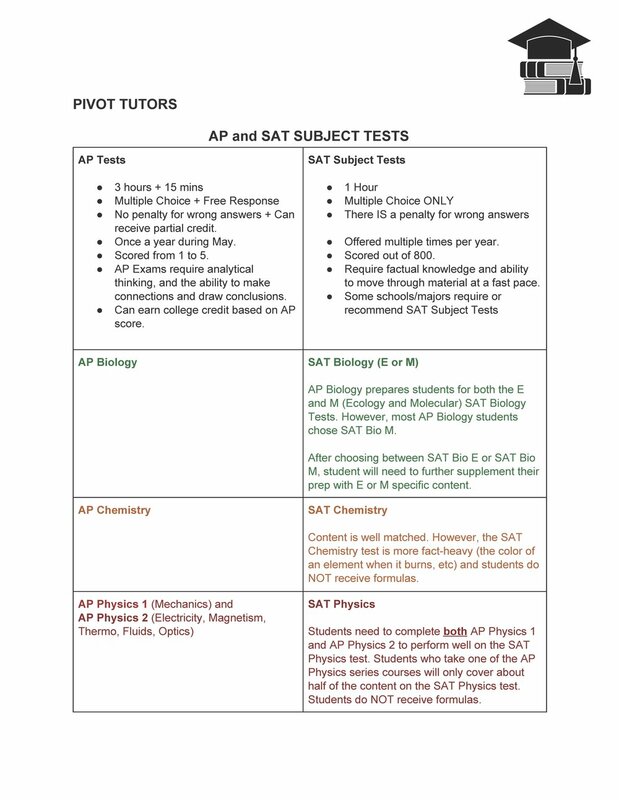 Pivot Tutors offers diagnostic tests almost every Saturday, and students take a real ACT and SAT test to determine which test they have the highest score potential on. Call or email us today to reserve your spot today! Whether you are just starting the college application process (👋juniors! ), or at the beginning of your high school career (👏 freshmen! ), it is important to find and work with a college counselor who will help guide you through the wild world of college admissions. They are your #1 resource when it comes to the college application process. Ask them as many questions as you can!! It is up to you to take initiative and take control of your own future! This means that you have to make the most of your time in meetings with your college counselors and get answers to the questions you want to know! When should I start preparing for the college application process? How do I know which schools are right for me to apply to? Am I taking the right classes in high school? What extracurriculars are important and how should I choose which ones to stick with? What should I include in my application essays? How do I ask for letters of recommendation? When should I start visiting college campuses? What do I do when I visit a campus? What should I expect during a college interview? Should I apply Early Decision or Early Action? This list is just the beginning! Come up with your own list of questions or meeting agenda BEFORE your appointment with your college counselor. SAT Subject Tests vs. AP Tests - What’s the difference? AP Tests and SAT subject tests similar in a lot of ways, and both tests give students advantages and can help students in different ways during the college admission process. Certain colleges require SAT subject tests (see previous blog post for more in-depth SAT II info), and many other recommend, or will consider, subject tests as part of a student's application. AP tests are taken in conjunction with specific AP courses in schools. Required by more selective schools in tandem with ACT/SAT scores, etc. All multiple choice- no essays included! Act much like a final exam for a class, rather than being tied to a school-specific class like APs, subject tests are taken on their own to demonstrate mastery in a subject. Which AP classes align with which subject tests? How well do the AP tests correlate with the SAT Subject Tests? Subject tests are scored on a scale of 200-800, similar to the subsection scoring on the SAT. Scaling and percentiles vary test to test, as do admission requirements for various colleges. Not all schools require subject tests, but some schools either recommend students take the tests, or will consider scores submitted by students. For schools that require the subject tests, it will be stated in their application process which tests/how many are required for an application. For schools that recommend the tests, their recommendations vary. Oftentimes, the colleges want to see your subject test scores in order to learn more about you as a student. These scores add another layer to your application story. Then there are schools that say subject tests are 'considered,' which simply means they will review the scores if you choose to submit them. When are subject tests offered? Subject tests are offered 6 times a year and are offered on the same dates as the regular SAT test. The list to the right includes the tests offered on the 3 upcoming test dates. Notice that not all subjects are offered on each test date! You can, however, take up to 3 subject tests on the same day. You cannot take the SAT and a subject test on the same day. Is there a difference between subject tests and AP tests? The biggest difference between these two tests is that AP tests can lead to college credit, and SAT Subject tests are not often used for that purpose. Outside of that, colleges do not explicitly require AP classes or tests, but having them on your transcript will boost the competitiveness of your application. SAT Subject tests are required by some colleges, and can demonstrate mastery of a particular subject. See our next post for more information/a comparison of the 2 types of tests! People often confuse percentiles with percentages, and it's easy to get them confused! Percentages are parts of a whole (think 50/100 = 50%). Percentiles are comparisons of one item to those around it - for example, if you are in the 90th percentile, you are scoring higher than 90% of all test-takers. How can I use percentiles to know if I did well on the ACT or SAT? Your composite score and percentile score will both tell you a lot about where you stand in comparison to other testers. 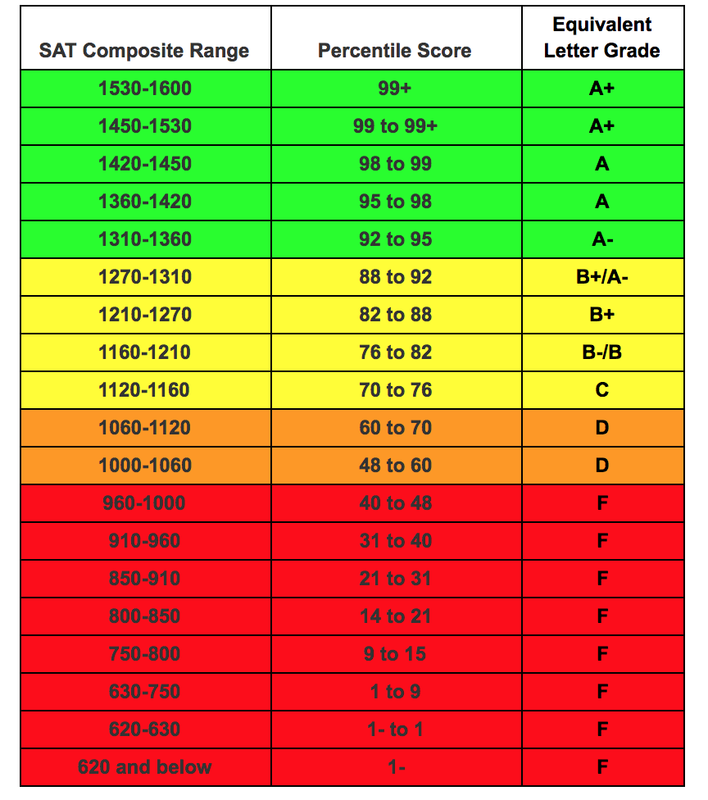 The charts below provide comparisons of composite scores, percentiles, and letter grades to give you a better perspective of what your score really means. Does the grade line up with how you feel about the test? Is the grade similar to the grades you get in English/Math/Science at school? If yes, then you've done a great job and should feel good about your test scores! If no, you should still feel good about your scores, because you just accomplished a great deal of work! But it's possible there are other factors standing in your way... Do tests make you nervous? Did you have enough time to complete each section? Was the length of the test unfamiliar and tiring? Have you taken a lot of standardized tests in the past? There are ways to combat these problems, but keep in mind that not everyone is awesome at standardized tests, and this may affect your score positively or negatively, depending on your test-taking style and abilities. How does test prep help me? Standardized tests have that name for a reason...they are standards-based, and are uniform no matter where you take the test. This makes your academic abilities measurable and comparable to other students in the nation. But this does not mean that the test box fits everyone, nor does it mean that everyone should fit into that box. By working with a test prep tutor, you will learn strategies that are specific to each test, and you will become familiar with the styles of questions asked on each test, the pacing for each section, and you will build your test-taking stamina. For SAT prep specifically, our past students have seen an average of about 50-100 points, but each student's growth depends on their starting score and how much time, effort, and natural abilities they bring to the test. For a student who is starting at a higher score, our first goal would be to get a 1400+ on the SAT, and then push for the highest possible score. For ACT prep, our past students have seen 2-7 points of growth, but again, starting scores, dedicated time and effort, and natural abilities all play a part in how much traction a student sees in raising their final composite score. It's hard to predict how students will do on the actual test because the majority of score improvement is dependent on a student's present academic foundation, natural capabilities, motivation, and availability/time. After that it is our responsibility to provide excellent test prep tutoring, curriculum, lessons, and materials. The responsibility to improve test scores lies 70% with the student and 30% with the tutor. At Pivot, we use weekly practice tests to keep track of student progress and improvement - to measure how much you are growing. The practice tests are our predictors of how students will do on their big test day, and they help us fine-tune our tutoring to identify each student's specific strengths and weaknesses. Typically, a student's final practice test will reflect the score they should receive on the actual test. What if I have a really high score? Do I still need prep? Once you reach the 32+ range, you've made it to the 96th percentile - which is outstanding! From a test prep perspective, there is not much more that can be done unless you are scoring much lower on one section of the test. Colleges use percentiles to compare you to other students. Percentiles allow admissions counselors to compare you not only with students who are coming from the same community/city/state as you, but on a national scale too. Knowing your numbers in advance can help you determine which colleges are right for you (and which you are a competitive candidate for). Here you can see the comparison between a range of SAT composite scores, the percentile these score ranges fall into, and the equivalent letter grade for each score range. Remember that these percentiles include the whole nation of SAT test-takers, so if you are above the 70th percentile, you are scoring higher than 70% of testers in the nation! For the SAT, as well as the ACT, there is the most movement within the middle scores/percentiles. Moving from a 1100 to a 1200 takes you from the 60th percentile to the 80th! Using this measure is particularly useful on the SAT, where the composite range is less familiar and feels less measurable, especially since the top scores/percentile rankings have a score differential of 300 points. (1300-1600 are all above the 90th percentile). Now here is a similar chart for the ACT - notice that it includes the percentile breakdown for each section of the test. It is interesting to see how the changes in percentiles measure up with the change in composite scores - not every section has the same level of difficulty, and the number of questions helps move the English and Math percentiles up and down more quickly. There is the most movement between percentiles in the middle scores (20-30). This means that if you are scoring in the low 20s, you have a great chance of jumping up in the percentiles if you raise your score even by 2-3 points. If you move from a 22 to a 26, you move from the 63rd to the 82nd percentile. That's a huge difference for a score increase that is very achievable! Similarly, if you more from a 27 to a 29, you are suddenly above the 90th percentile, which puts you in the top 10 percent of students in the nation - a very competitive position to be in! Within the top scores (above a 32), there is very little difference between the percentile rankings, which means that unless you require a higher composite to apply to your desired schools, you don't really need to retake the test. Remember these questions again - does your score on this test reflect what you have learned at school? Do your grades give you an accurate prediction of how you performed on the ACT or SAT? This should help you determine whether or not you need tutoring, or if you want to take the test again. Testing Accommodations - Who gets them, and how? Who receives & qualifies for testing accommodations on the ACT and SAT? Students with disabilities that are recognized and documented by their schools will potentially qualify for accommodations. For example, students with IEPs for learning or physical disabilities will qualify for accommodations similar to what they receive at school. Students with specific medical needs may qualify for different accommodations (test blood sugar, take medication, etc. ), but would need to check with the each specific test provider. Students must be on record as needing or receiving accommodations from his/her school and have a diagnosis before applying for specific accommodations on the ACT/SAT. Documentation of a specific disability (IEP, diagnosis from a doctor, documentation of accommodations provided at school). Additionally, when applying for accommodations in high school, the ACT and/or the College Board may request additional evidence to demonstrate history of this disability throughout the student's earlier academic years. Timely applications are a MUST in order to receive accommodations on the ACT and SAT test. This allows parents and families the opportunity to appeal the decision if denied accommodations but this takes time and patience, so start as early as possible to give yourself time before the test date to go through this process. The accommodations process can take between 1 to 4 months, and typically requires your school counselor or the school learning center's involvement. START EARLY! Don’t wait until fall of senior year to try to get accommodations. If you would like to apply for accommodations for your student please contact your school counselor ASAP. What kinds of accommodations are available? But all of these accommodations must match what the student is already receiving at school per his/her IEP/504. There are specific accommodations for physical disabilities and medical conditions, but are usually determined on a case-by-case basis. There are read-aloud options (most often offered via audio/computer) for students who receive this accommodation at school. If you think your child needs a learning assessment, contact us for a list of trusted doctors in the San Diego Country area. SAT Accommodations are easier to get than ACT because if the student has a documented disability in which they receive accommodations for at school, the College Board will automatically give the student accommodations on the SAT. You do NOT need be registered for an SAT to apply for SAT accommodations through the College Board. Most students will work with their schools to submit SAT accommodation requests online. Schools will usually have an SSD Coordinator (Services for Students with Disabilities) who will help families during the accommodations request process. Contact your school counselor to get the process started. To submit a request without the schools involvement, families must request a paper Student Eligibility Form from their school counselor or SSD. Additional information for Accommodations through the College Board can be found here. Students MUST be registered for an ACT test prior to applying for ACT test accommodations. If the student is not registered for an upcoming ACT test, the ACT will automatically deny the accommodations request. When you register for the ACT, please DO select the box for indicating the need for accommodations during the test registration process (online through the ACT website). The ACT will email you instructions for the next steps, which will also involve sending forms over to your child’s school. ACT has a easy to follow 4 minute video to explain their accommodations process. Once a student is granted accommodations, it will apply to their future ACT tests unless otherwise specified in certain cases. Please contact the ACT and/or the SAT along with your school counselor if you have any questions about the SAT/ACT accommodations process. START EARLY! Don’t wait until fall of senior year to try to get accommodations for the SAT or ACT! We hope this sheds some light! What are TIR and QAS? How do I use them? 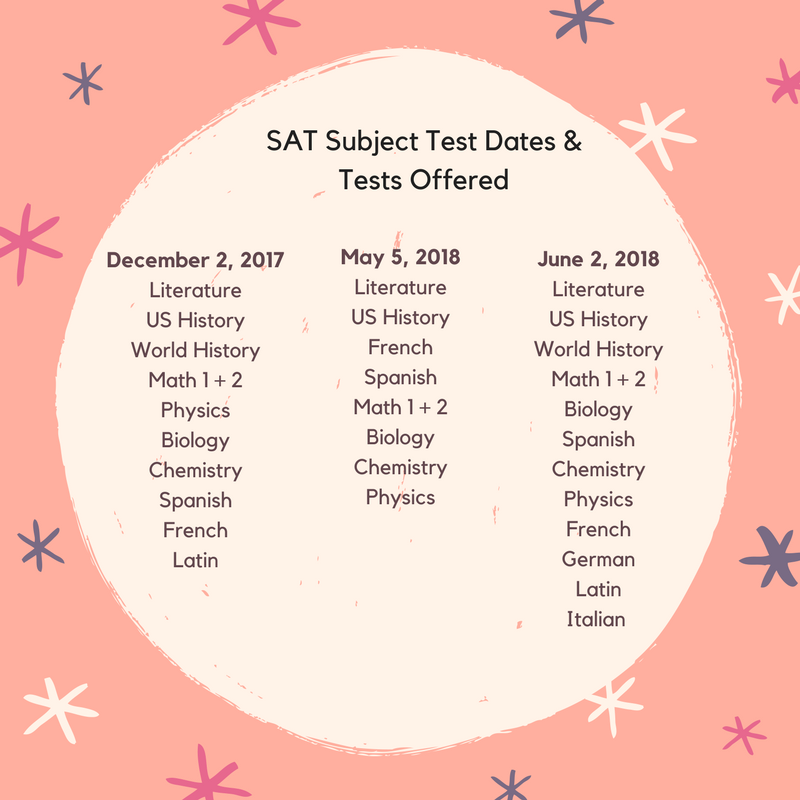 Both the SAT and the ACT offer services that allow students and parents to order the test booklets and answer keys for certain test dates (students must either be registered or have taken the test on those specific test dates in order to qualify). The process is simple, but not well-advertised, and is often overlooked because families have no idea they can! It will help you study! If you know which questions you got wrong, you will be better able to refine your studying and pinpoint the topics you need to focus on. You will be able to see if you missed a question because you did not understand the material, or because of a mistake like incorrect bubbling, mis-reading the question, or inverting a response, etc. If you made a mistake--oops! Now you know what kinds of mistakes you make, and can look out for them on the next test you take! If you are a 10th grader, and have never taken the test before, request TIR and you can use it to prepare for the test you will take as an 11th grader! Take a TIR/QAS test early enough so that you can receive and go over the materials with enough time before you take your next test. If you are working with us at Pivot, your tutor can help you go through your results and decode and strategize for your next test! Real-life examples are great for helping your tutors understand how you test and the types of problems you miss. Please contact us at info@pivottutors.com if you have any questions! Here are the 2017 ACT and SAT Test Dates! New this year, SAT is offering an August 26 test date during the summer. This also is the final year that the SAT will be offering a Jan test date. For Juniors, if they have not started thinking about taking one of these test, the time is now. For 10th graders, the summer is a perfect time to prep if you have taken the test prerequisites, especially for math. We offer free diagnostic ACT and SAT testing, contact us to reserve a spot. If you have any questions about ACT vs SAT, we are happy to answer any questions. What is super scoring? When a college takes the highest score from each subsection over multiple ACT or SAT tests and builds out a new overall ACT or SAT score that is made up of ONLY the student's highest subsection scores. Super scoring is fantastic if the college your student is applying to does it. However, each college has its own rules for super scoring the ACT and SAT. Some schools require ALL the test scores from either the ACT and SAT. Other colleges will super score between multiple tests of the same type. I highly recommend that you check the college websites and find out what their test score policy is. What this means for students: Take the tests multiple times! Because so many colleges now super score the ACT and SAT, its worth it to take the test at least twice. I have included a list of top 300+ and what their super scoring policy is. Congratulations to the Class of 2016 Pivot Tutors Students!! Pivot Tutors Class of 2016 Seniors! Here are the Universities that our amazing, hard-working, and dedicated Class of 2016 Students are attending! Students attended Bishops, Torrey Pines High School, Canyon Crest Academy, Cathedral Catholic High School, High Tech High, La Jolla Country Day School, La Costa Canyon High School, Del Norte High School, and Westview High School. Congratulations to you all! We wish you the best in the next exciting step of your academic journey's!